Almost eleven years have passed since the US toppled Saddam Hussain’s regime, and Iraq still continues to struggle. In December 2013, Iraq national security forces stormed the private residence of the Iraqi Finance Minister, arresting several of his staff for supporting terrorism. This incident served as a trigger for sectarian violence throughout the Sunni triangle in southern Iraq – Al-Anbar Province. It was one of the areas that led peaceful demonstrations on February 2011, but subsequently witnessed the highest amount of sectarian violence, including government security force attacks on civilians. The recent advancement of Islamic State of in Iraq and Syria (ISIS or Daesh) forces in Mosul and other areas in Iraq has caused great concern about the prospects of peace. Policymakers are scrambling to figure out an appropriate strategy to limit further advancement and prevent further security breakdown. Amidst this uncertainty, one thing is clear: preventing the further breakdown of the Iraqi state and the growth of violent extremism is a goal of international and regional actors, as well as Iraqi authorities. But ISIS’ advancement in Mosul is not a new phenomenon. ISIS has managed to gain strength in other areas within Syria and Iraq before. 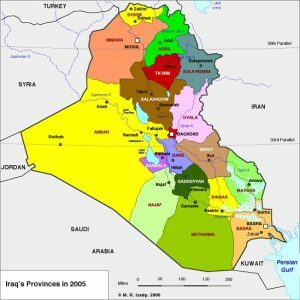 Studying patterns in these areas may help in identifying strategies on how to move forward to build a lasting peace in Iraq and in the region.